After stumbling across The Gypsy Mama today I knew that spending five minutes of my Friday to just write was a perfect idea. Obviously I love writing (why else would I have two blogs? ); and an excuse to just write, no editing, or fear of judgment, sounds good to me. 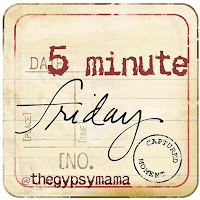 So here's to Five Minute Fridays. Community for me is support. Not always physical support, or even vocal support. But that presence that comes with being around other people who know you well enough that words aren't needed. Just being is enough. That way as the words flow you don't feel concerned, or judged. Just supported. Although I've grown up in the same area I live in now, I'm just starting to really build up a close community of peers that are in the same life stages as me and my immediate family. It is a process. Community doesn't just happen. You have to work at it. You have to make the decision to grow relationships with certain people, and be around them, physically, on a regular basis. Sometimes that means being silent and listening to them, other times that means you get to pour out all your thoughts (well within reason of course). There is something about this process that strengthens us. That process is community. And to think that after all the work at building your community, they are there for you. You are there for them. What joy that brings. I can't wait until I'm so close to this new community that I can see them as the people I turn to, and know that they will turn to me. Blessings. Ready to spend five minutes releasing those thoughts bouncing around your head? Spent five minutes writing about community, then head over to Gypsy Mama and join the party. Also, thank you so much for linking up with me! Your post is wonderful! I love this: "Community doesn't just happen." Very, very true. Loved your thoughts on community. Community can be hard and it can be healing. Women were made for it, and as much as I wish it weren't so sometimes, I need it. Making the effort is always worth it!